… and I almost responded to the person who posted it. Then it occurred to me that many people might be thinking the same thing, so I thought I’d blog about it. I will be the first to admit that doing fun things with the kids can get expensive. Most people think, amusement park, zoo, movies, trips, and other “big bucks” ideas. Believe it or not, most kids just want to do something fun with their parents. It doesn’t have to be expensive to be fun. Of course “going” anywhere that is a great distance will require gas money; games and snacks will require a minimal purchase; and water fun will add to the water bill, so keep that in mind. Trace them outside with sidewalk chalk, then let them trace you. And the list goes on. 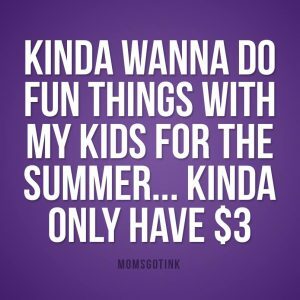 If you stop to think about it, there are all kinds of fun things parents and kids can do together that don’t have to break the bank to do them. One of our favorites is making ice cream. I’ve included the recipe and directions below. I’m sure you’ve heard the saying “It’s not quality, it’s quantity.” I have to say, I disagree. In this day and age quality of time matters just as much as quantity of time. How much fun is it for you to hang out with your teenager when all they are doing is texting other people? The same is true for you. Your children are not having a fun time with you if they don’t have your full attention. Be present in the moment. Now that I’ve given you some ideas, come up with some more and… go have fun with your kids! Combine milk, cream, and sugar in a gallon bag. Put into the 2nd gallon bag to avoid leakage. Close the lid to the container and shake it like crazy. Shake constantly, rotating around, possibly pause to pour out water and add ice but go right back to shaking. Shake for 10-15minutes, until the ice cream is pretty solid. Eat immediately, as it will melt quickly. *Pam Horton Is a Board Certified Advanced Christian Life Coach and Parenting Coach.